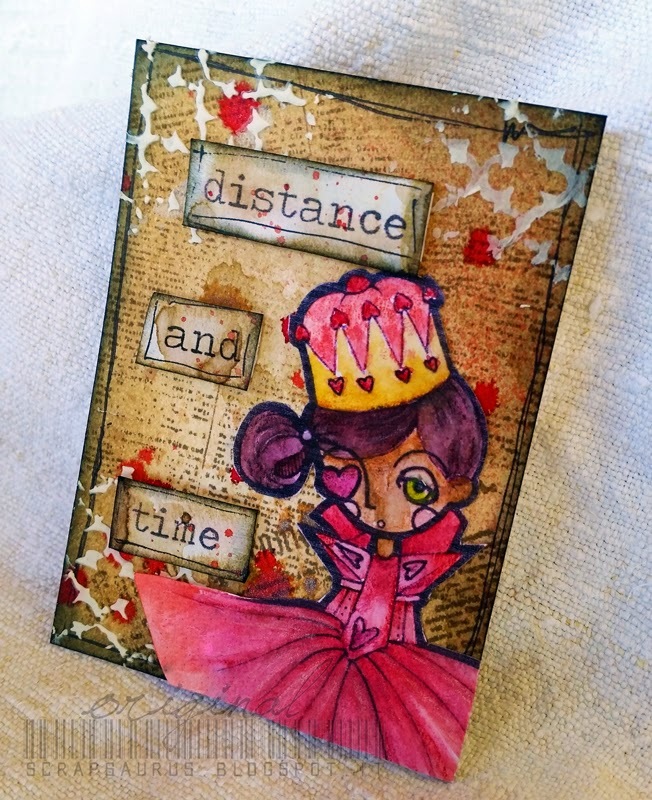 Zoey's here today to show you what I created with this supreme stamp: Queen of Hearts ! The digital stamps comes with two amazing sentiments, one set of "hearts" and of course...she...the Queen of Hearts! You can find the digital stamp by clicking here. Sooo...back to what I created! But first of all....let me just remind you that I am NOT a colored pencil artist -- but I wanted to give it a try..because that is what you all should do...Give it a try from time to time and step outside your confort zone! You will be amazed - unless you are a bad at coloring like me LMAO! JK! I made this ATC, I have some pre cut bristols so all I had to do was coloring the background. To do that I used a combination of distress inks: Antique Linen, Old Paper and Frayed Burlap. I then spritzed over the ATC some Lindy's Stamp Gang Starburst: Poincianna Red Flame and Steampunk Sepia. I stamped over a newsprint stamp by Prima/Finnabair using Vintage Sepia Versafine as Ink. All I had to do was to add some more splashes here and there and add modeling paste. I printed out the beautiful stamp using a light watercolor paper since I didn't want to add too much bulk to the ATC and then I colored the stamped image with Faber-Castell Pitt Pastel. 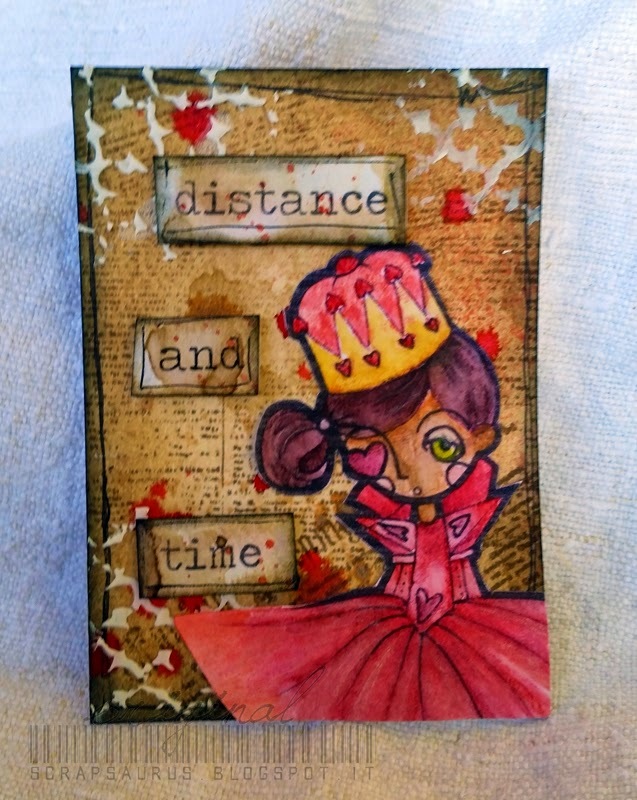 I fussy cut the Queen of Hearts and adhered to my ATC. The sentiment is from a song that is very dear to me: Distance and Time by Alicia Keys. I think that this stamp fits perfectly in my ATC. If you have facebook do not forget to join us in the Shaky A. Stamp group! It is a friendly group where you can share your creations with Shaky A. Stamps , get/give constructive critique or simply! Stay happy, stay creative...till next time! it's for me, right?! Amazzzzzzzzzing! She is Perfect Loooove all the mixed media you have used and love the song too!